Since 2002, Chicago-based Genuine Scooter Company has been securing a place in the US scooter market with successful models like the Stella and the Buddy. In 2015 they announced they’d be getting into the bigger machines and founded sister company Genuine Motorcycles. Now the first Genuine machine has landed, the G400C. It’s a retro-styled, affordable entry-level model with an interesting mix of old and new. The engine is a single cylinder, fuel-injected 397 cc affair that maxes out at 26 horses and 22 ft-lb of torque. Genuine claim a top speed of 80 mph. With numbers like that, it’s pretty clear that the G400C is designed to be friendly and mostly limited to urban and suburban duty. The 353 lb dry weight just reinforces it. It’s as much a style exercise as anything, with a lot of callbacks to a past era. The teardrop tank, the gaiters on the front forks, the coilover rear shocks, analog gauges, laced wheels, steel fenders and drum brake on the rear all scream 1970s. It even has a kick starter as a backup. More modern are the twin-caliper, 280mm front disc brake, the five-speed gearbox and the interesting choice of tire size — 19″ on the front and 18″ at the back. As for the provenance, Genuine Scooters has been in partnership with Taiwanese company PGO Scooters. They don’t do their own manufacturing, and they’re not manufacturing the G400C either, it’s imported. Which brings us to the actual appeal of this bike — affordability, to run and to own. Genuine claim it will get 70 miles to the gallon. And the price is $4599. That puts it below the smaller-displacement Suzuki TU250X and over a grand cheaper than the Yamaha SR400. 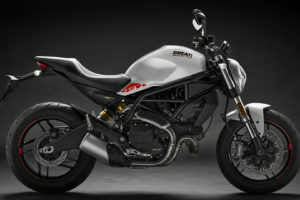 The Genuine Motorcyles G400C will be available in 2019 at the sister brand’s 240 dealers nationwide.